"The American dream seemed to be alive & well everywhere except for America." That's a depressing but sadly true quote from documentary filmmaker Michael Moore in his new documentary Where to Invade Next, which is definitely his greatest film yet. In this new documentary, Moore has been "sent" by the US government to "invade" other countries to "steal" their great ideas. He first goes to Italy, where every job has a required 8 weeks of paid vacation time, & mothers get 5 months of paid maternity leave. When Moore asks the founders of an Italian clothing company if they would ever cut their employee's pay at all so they could be richer, they say no, stating that a happy worker is a productive worker, & as long as they make even a small profit, they are happy. His next stop is France, where students get a full hour for lunch, where they are served high-quality food by the cafeteria staff (when the students see what American students are served, they are disgusted). He then goes to Finland, which has one of the world's best education systems in the world. He is shocked to discover that Finnish students receive little to no homework, there are no standardized tests, & students go to school for only 20 hours a week, with teaching based around the growth of the whole person. Moore is told by a principal at a Finnish school that children need to have time to be children, & not have so much homework. He then travels to Slovenia, where college is absolutely free (even to foreign students, & the only fees are for registration), & when the government tried to get rid of free tuition, the students revolted. He then goes to Germany, where employees are required to make up half of corporate boards of directors, & workers that are stressed get 3 weeks off from work to go to a spa to relax. Also, Moore says that all countries have an original sin (Germany's being the Holocaust). In atonement, Germany provides frequent reminders of the Nazi horrors through monuments & landmarks. He then goes to Portugal where all drugs have been decriminalized, actually reducing drug use. After that, he goes to Norway, where the maximum prison sentence is 21 years, & there is no death penalty. Prisons there are meant to rehabilitate people for them to return to society, & all prisoners are treated as human beings. Prison cells in Norway are like small apartments with TV's, cookware, gaming systems, computers, etc. Moore visits with the father of one of the children killed in the 2011 Norway attacks, where 8 people were killed by a bombing in Oslo, & 69 others were gunned down at a camp on an island. When Moore asks him if he would kill the gunman if he had the chance, he said he wouldn't because he is a human being, & if he did, it wouldn't bring his son back. Moore goes to Tunisia, where they finally got an equal rights amendment passed (which we failed to do in the 1970's). Finally, Moore ends his "invasion" in Iceland, which elected the world's first female president & where female leaders made sure that bankers responsible for the financial crisis in Iceland were sent to jail (unlike the United States after the 2008 financial crisis). In an epilogue, Moore remarks that enormous positive change happens very suddenly. His examples of this were the fall of the Berlin Wall in 1989, & the fact that 3 years ago, gay marriage was illegal in most of the United States, & now it is legal throughout the country. The film was extremely eye-opening. Moore has finally brought back his trademark sense of humor with this film, his first documentary since 2009's Capitalism: A Love Story. 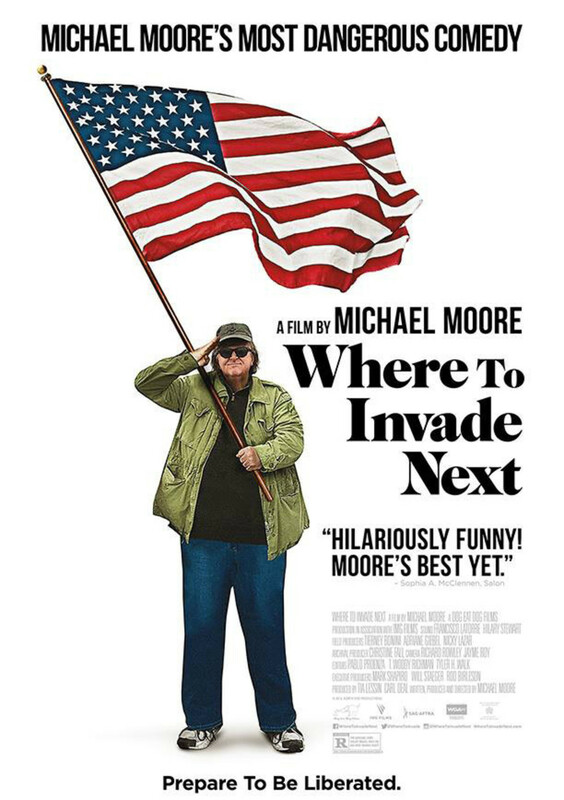 While Moore has been divisive in the past, it looks like this film should rather unite us, rather than divide us. Overall, this is definitely the best documentary I've ever seen, providing great ideas for us to talk about, & also providing hope for the future.